DL Equipment Provides Quality Used And New Heavy Equipment And Attachments For All Makes And Models. We Have other Sizes available. 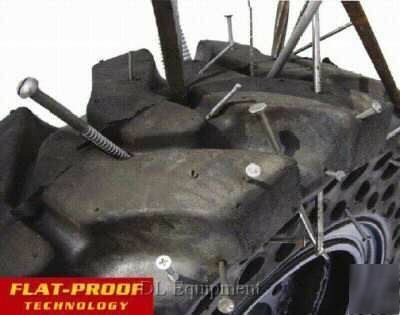 Here You See A Tire That Will Keep You Running On Any Surface. Tires Are Made From Enhanced Rubber Compound Design For Greater Cutting And Chunking Resistance. I Offer The Best Prices In The Market On All Our Tires, Tracks And Equipment. You Don't Have To Shop Any More For Good Prices. I Will Give You The Quality Service You Deserve. Look At The Deep Tread It Will Give You The Traction To Do Your Job In Less Time. Tires Have 3 to 5 times the life expectancy of regular pneumatic tires. All Tires Have 12 Months Warranty. All Tires Come With Wheels For Easy Installation. Flexible Cells Offer Pneumatic Type Ride - Protects Machine, Increases Driver Comfort. Less "Bounce" Compared To Pneumatics For Greater Stability, Operator Control And Safety. Tires Look Good On Any Skid Steer. Oil Prices Are Going Up And Summer Is Here, So Get Your Tires Now Before Price Go's Up. Look In Our Store For Skid Steer Tracks.